Nestled in the floodplain between North Portland, Oregon, and Vancouver, Washington, a housing project was built to help house World War II shipyard workers. 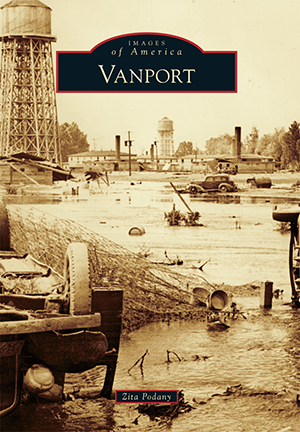 Its very name, Vanport, is derived from Vancouver and Portland. When the United States entered the war, the demand for ships and for workers to build those ships became a huge priority. Workers were recruited from all corners of the United States. Portland had a serious lodging shortage, so much so that these workers lived in cars, tents, parks, and whatever shelter could be found. Vanport, built in a little over a year to house them, was a city that did not sleep. In its heyday, Vanport was the second-largest city in Oregon with a population of over 40,000 residents. It was a city with many firsts. It was a city that touched many lives in a very short period of time. And on May 30, 1948, it was a city that disappeared just as quickly as it came into existence, leaving a legacy that will not soon be forgotten. Zita Podany is a longtime resident of Portland and has for many years been fascinated with the story of a city that once thrived in an area full of marshes and sloughs.